"That thing costs more than a house!" was the remark I frequently heard during my week-long test drive of the British-made 1996 Range Rover 4.0 SE from Land Rover North America. Indeed, the Range Rover 4.0 SE's $55,625 base price roughly matched the price I paid 12 years ago for my first home, a tiny two-bedroom, one-bath bungalow that needed a lot of work. Two years later, a couple who saw more value in the trendy address than I did gave me $10,000 above what I had paid for it, about the same price as the 4.0 SE's fancier sibling, the 4.6 HSE outfitted with a bigger engine and tires. As with my house, the worth of the Range Rover is in the eye of the buyer. Indeed, the Range Rover boasts a rich tradition unrivaled by most other sport-utilities. Range Rover has served as the modern-day carriage for the British royal family. Its off-road prowess is routinely demonstrated in treks across the Sahara desert and the Central American rain forest in competitions. Permanent four-wheel drive has been standard fare since 1948, and other technological features, such as its adjustable air suspension, set the Range Rover apart from other sport-utilities. Likewise, its price puts it into a class unto itself and into the driveways of classy neighborhoods. Its looks, however, have moved more mainstream. After 25 years wearing the same boxy shape, the Range Rover recently received a complete makeover. 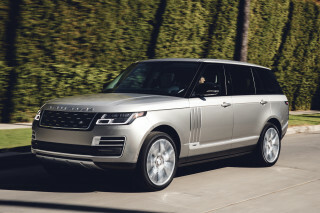 Introduced in the United States a year ago, the new design retains traditional Range Rover styling cues, such as its rugged grille, but its lines are softer than its straight-edged predecessor. Inside, the Range Rover is outfitted in leather seats and tasteful touches of burled walnut on the doors, dash and center console. It comes with more standard amenities than many luxury cars, including individual climate controls for the driver and passenger, heated eight-way adjustable power seats and a six-disc CD changer with the 11-speaker audio system. Drivers, using two memory settings, can position seats and mirrors and light the instrument panel to their liking remotely. Dual front airbags and door beams to protect occupants in side-impact crashes were included with its latest makeover. The Range Rover has its charming eccentricities. The toggle switches for the windows, located on the center console, appear backward to Americans: front switches operate rear windows; rear switches work front windows. Likewise, the side mirror adjustments seem reversed. Unique also is the turn signal that emits a clip-clop sound like horses' hooves. From behind the steering wheel, I had a commanding sense of the road as I looked forward into the windshield from my lofty perch. However, a serious blind spot, made more pronounced by the headrests for the rear seat, requires extreme caution and constant monitoring of all mirrors. Otherwise, driving the Range Rover is quite easy and not dramatically different from driving any other sport-utility. Seats-two buckets in front and a 60/40 split folding seat in back to accommodate three-are extremely comfortable. Headroom is good in the back, but tall drivers complained their heads rubbed the roof in the front. Rear seats can easily be folded flat to add to cargo-carrying capability. No space is lost to the spare tire, which is housed under the floor of the roomy cargo bay. Access to the rear cargo area through the traditional tailgate is difficult for short people. For loading groceries, I had to pop open the upper glass, lift the bags in and set them into the vehicle. With a 4.0-liter V-8 engine rated at 190 horsepower, the Range Rover is no speed demon from the stoplight. In fact, acceleration from 0 to 60 miles per hour is something over 10 seconds. (The 4.6-liter HSE knocks two seconds off the 0-60 time.) Still, acceleration was adequate for around-town driving. Large four-wheel, four-channel anti-lock brakes stop the 5,000-pound Range Rover confidently in its tracks. Fuel stops are frequent. The Range Rover is rated at 13 miles per gallon city and 17 m.p.g. highway, and my mileage over the several hundred miles of highway, city and off-road driving was about 14 m.p.g. With a 25.6-gallon gas tank, the Rover's range is just over 300 miles. However, the power of the Range Rover's V-8 makes it ideally suited for off-roading. About a third of Range Rover owners, more than the owners of most other sport-utilities, take them off-road. Equipped with permanent four-wheel drive, the Range Rover also has a low range, engaged by using the shifter on the center floor. Diagrams of hills indicate which is the best gear for inclines and declines. The Range Rover handily ate up the washboard trails of abandoned railroad bed without tossing its passengers about too severely. It squeezed through muddy narrow passages of the forsaken gravel pit, past a rusted skeleton of a snowmobile. Adding to the Range Rover's off-road prowess is its air suspension that adjusts its height upward, adding a couple of inches to its 8.5 inches of ground clearance for plowing through deep water and snow, or lowers it to make exit easier and handling better on twisty roads.